Recently, Damita spoke for the first time about her divorce with singer and ‘Preachers of LA’ reality star Deitrick Haddon. 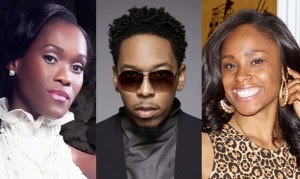 In a tell all interview with Path MEGAzine publisher Kris Patrick, Damita gave elaborate insight never before told on why Deitrick Haddon left her for his new wife Dominique. Now Deitrick Haddon’s new wife Dominique Haddon is responding back on social media, recently posting messages on twitter and instagram about Damita’s version of events. See post below. Earlier there’s an interview where Damita insists that before Deitrick left her she was under the impression that their problems had been reconciled in June of 2011. Damita disclosed that Deitrick left her two days after she buried her mom, only to find out in December of 2011 that someone was pregnant. Damita wasn’t surprised when hearing about the baby, saying her intuition told her that someone was pregnant after Deitrick abruptly left her and his church behind. Watch the interview. Now Deitrick Haddon’s new wife Dominique Haddon is responding back on social media, recently posting messages on twitter and instagram about Damita’s version of events.